Organic Shimmer® is the leader in organic airbrush spray tanning and solarium tanning (UVA tanning). Our products are toxin free, and contain organic and natural ingredients. Most noteworthy, packed with aloe vera, jojoba oil, coconut oil extract, vitamin E, Vitamin D, and anti-aging agents. Founded in 2011, Organic Shimmer® started as a mobile pop up tent organic airbrush spray tanning service. Within a year, Organic Shimmer® outgrew the pop up ten tanning business. Therefore, our first brick and mortar airbrush spray tan salon opened in 2012 in the Marina District, San Francisco, CA. Our dedication in creating the best spray tan result while making sure we provide a clean and safe environment for our clients and staff exploded in popularity. The demand for expansion resulted in the opening of our second location and full service spa in SOMA district of San Francisco. In addition to spray tanning, we offer blowouts, eyelash extensions, hair removal, facials and skin care just to name a few services available at our SOMA spa location. 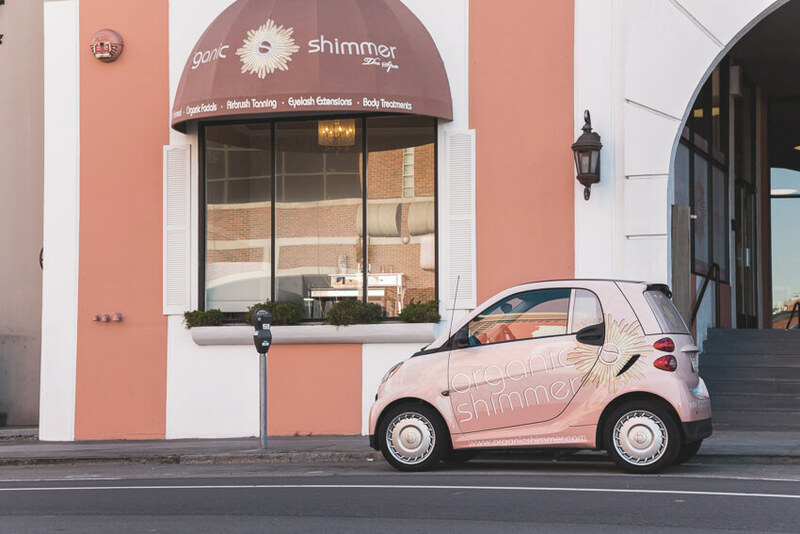 In 2016 Organic Shimmer® Took LA by surprise opening our first location in Los Angeles on Melrose Avenue. Shortly after our grand opening, many celebrities and famous beauty bloggers flocked to our salon for that perfect bronze from our organic airbrush spray tanning salon. Here at Organic Shimmer, our customers’ safety and satisfaction is our #1 priority. We are a salon that offers organic airbrush spray tanning as well as natural and/or organic products. We ensure that each spray tan client’s experience is perfect, safe, and relaxing in our clean and beautiful environment. Want to see pictures of our happy clients after receiving their services from one of our locations? Check out our Instagram page, and Facebook page for social media updates. You can also visit our gallery for some before and after pictures. Book your appointment now and explore our many luxurious services and membership packages!